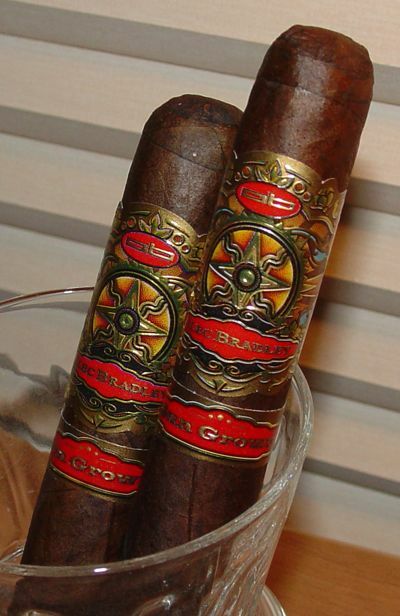 Alec Bradley’s Sun Grown cigar is distributed as a Famous Cigar private label, so there is limited information about it available. 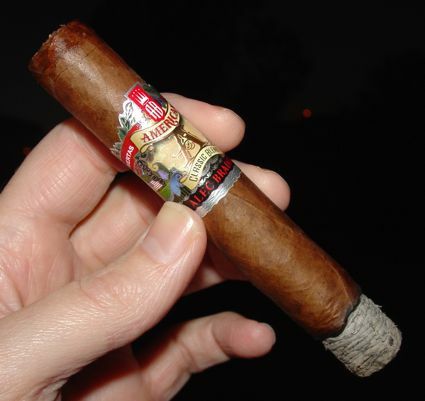 The distinguishing feature of the blend is a Mata Fina wrapper from the Bahia region of Brazil. 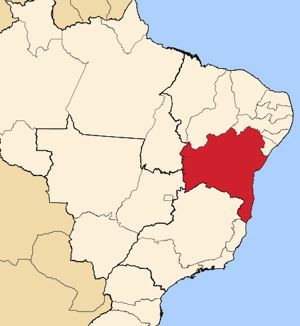 Mata Fina is a region in the Reconcavo Bahiana, the “bay area” of the state of Bahia. Much of this part of Brazil has been cleared of its natural forest over the years and secondary regrowth has taken place. “Mata Fina” is a farmer’s term for the type of regrowth, secondary forest, in this area. The climate and soil is excellent for tobacco cultivation — tropical weather with plenty of sun (though an average of 42 inches of rain annually) and sandy soil that provides good drainage. 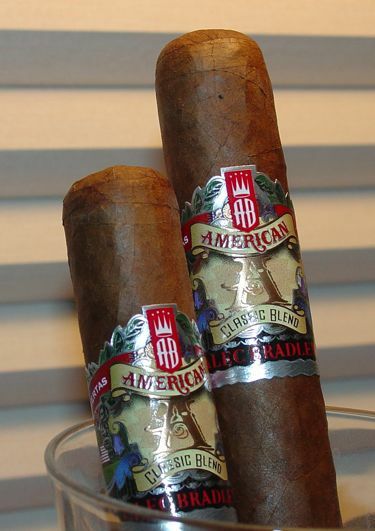 Tobacco farmers like to point out that Bahia is the same distance south of the equator that Cuba is north of it. Tobacco is native to Brazil and was quickly adopted by early Dutch and Portuguese settlers. 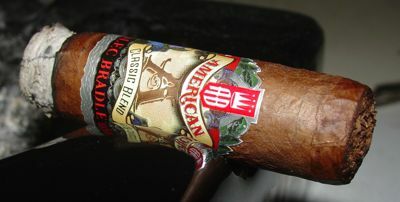 By the late 19th century it was one of Brazil’s leading exports, both in raw form and finished cigars. Brazil still produces a prodigious amount of tobacco (and a few blends of Brazilian puros) but the vast majority is now exported to major cigar manufacturers in Central America and the Dominican Republic. 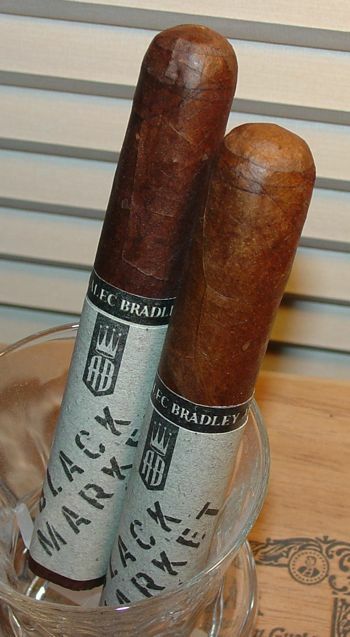 I haven’t seen how the Alec Bradley Sun Grown is packaged (I picked up a five-pack from Famous), but they look box-pressed to me. The roll is a little bit soft and seems to have taken on some press. The wrapper is dark and rich in appearance, though every bit as rustic as you’d expect from a sun-grown leaf. The cap is purely functional. Actually, the stick seems to have been designed without aesthetics in mind at all — maybe after looking at the wrapper they just threw in the towel. The band, on the other hand, is gorgeous. The secondary “Sun Grown” band is probably unnecessary though. 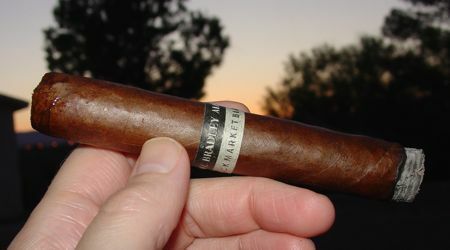 The robusto burns quite well — straight, with an even draw, and a smooth light gray ash. The robusto starts up with a flare of sweet spice, but it’s not the explosion of pepper that is common to a lot of Nicaraguan cigars. It’s palate-tingling, but it’s more like the minty flavor found in Cameroon. There is a mild bite on the tongue and the aroma is sweet and complex. I have a hard time distinguishing the scents on the nose at this point, but the base flavor is coffee and earth. 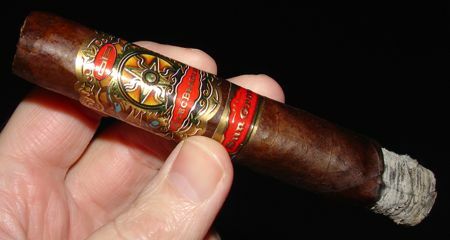 Cruising into the mid-section the smoke gets a bit smoother on the palate but remains spicy upstairs. As the flavors settle and coalesce there’s a hint of cherry over the continuing coffee and earth underneath. 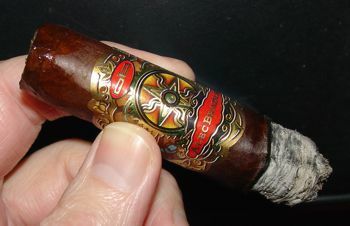 The complexity of the cigar diminishes as the cigar burns into its final stage, concentrating on coffee, earth, and that minty or clove-like scent with which it opened. The coffee dwindles into a burned flavor and starts to turn bitter at the very end of the smoke. (One of the three I’ve smoked so far was a dud. I’m going to count that one out of my assessment, but I’d be interested in hearing if anyone has had a similar experience. Maybe there was a bad leaf in there or something. 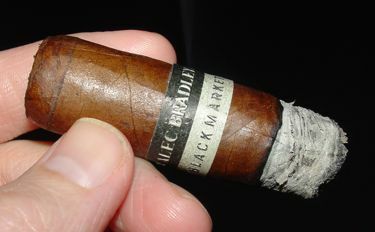 If anything it shows that you have to smoke more than one cigar (preferably several) before passing judgment on a blend. 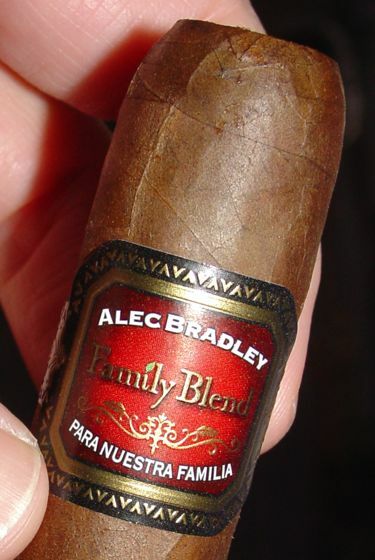 I don’t usually expect much from large distributors’ exclusive cigars, but the Alec Bradley Sun Grown was a good one. The complexity of aromas that the mata fina wrapper contributes really distinguishes the cigar, and at a price around 5 USD it makes a great everyday smoke.